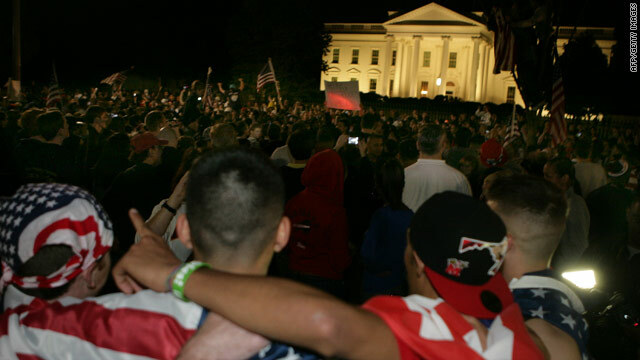 People celebrate the announcement of the death of Osama bin Laden at the White House. Many of my students partied in the streets and on nearby Boston Common after President Barack Obama announced to the world that bin Laden was dead. Others found those celebrations not only inappropriate but morbid - fit for Mardi Gras, perhaps, but not for the demise of a fellow human being, however odious. When I turned on the television on Sunday night and saw the impromptu partying, I cringed. I wasn’t sure why, but I didn’t like the optics. A student today helped to clarify my reaction. It looked to her - and to me - like images we had seen before: people celebrating in the streets in the Muslim world after the 9/11 attacks. Have we become, she and I thought, like them? Another student said that all the liberal hand-wringing about the propriety of the parties (including my own) was rooted in an inability to face up to our shared humanity. It is human to get angry. It is human to want revenge. It is human to hate your enemies, and to throw your hands in the air in exultation after they are killed. Still, I couldn’t help noticing that the contingent in favor of the partying seemed farther removed from the events of 9/11. Students from New York City who had lost friends or family members on 9/11 - including one who said she went to 15 funerals in the days after the attacks - were in general more somber and reflective. Instead of celebrating bin Laden’s demise, it seemed, they were reliving the horrors of that day. I didn’t lose any close friends on 9/11. But I thought that the visuals of drunken Americans chanting mindless (and often vulgar) slogans were not in American national security interests. There are lots of people around the world who hate America, and this was doing nothing to make us any more likeable. But the key reasons for my disquiet were more psychological than strategic. I just don’t feel comfortable celebrating anyone’s death. I think it comes down to an awareness of our shared mortality; the death of another human being reminds me of my own. And that is not a cause for celebration. But the main reason I felt uncomfortable watching the bacchanalia in front of the White House and on Boston Common is because when it comes to death –anyone’s death - I feel I am in the presence of a great mystery, perhaps the great mystery of human life. And at least for me the appropriate response to that mystery is awe. One of my students (she was in the anti-partying contingent) said that moments like this should lead us first and foremost into reflection. That is precisely what my students did for me today. Thank you for another tfnormaiive blog. Where else could I get that type of information written in such a perfect way? I have a project that I am just now working on, and I have been on the look out for such information. Anyone notice that we got a dude in GITMO who was the mastermind behind 9/11 and we are keeping him alive yet our SEALS couldn't just capture an unarmed aging saudi who everyone else said was the mastermind of 9/11? The story is true. In the section of the Onion that you've rrfeered to, they use true stories and make up fake quotes from from fake people. Did you click on the link before you posted this? To fight against terrorism led us to commit a family massacre in front of their children and drag their dead bodies again in front of their children, in their family home and famous celebrations over it in the States too. This reminds me of archeological findings about Neanderthals who had funeral ceremonies, burying their dead with flowers and that they took care of injured individuals between 60 and 80,000 years ago. Felix you said:"To fight against terrorism led us to commit a family massacre in front of their children and drag their dead bodies again in front of their children, in their family home and famous celebrations over it in the States too. "Sadly, but YES, we will! We MUST do what it takes to keep them from bombing, kidnapping, slaughtering and any acts of terror against innocent civilians. Never did we have "famous celebrations over it in the States" for a terrorist's death other than Bin Laden's. We didn't have even celebrated on Saddam's Death. Moreover, in Bin Laden's death we celebrated for the lives of innocent people rather than his mere death. We didn't celebrate revenge but rather justice that have been served. And also you said: "This reminds me of archeological findings about Neanderthals who had funeral ceremonies, burying their dead with flowers and that they took care of injured individuals between 60 and 80,000 years ago." So you meant to say that Neanderthals are far better than us when it comes to respecting the dead bodies, right? It never cease to amuse me, how people like you could easily condemn the way the carcases of these evil animals are treated. Did they show some respect with the body of (when they are mutilating the head) of their kidnap victims? Did they have some respect even their own body when they shout allahwakbar and blow themselves into pieces together with other innocent lives? I guess not, they didn't show any respect but yet they're honored and martyred, right Felix? You should have let this thread lay down to rest as Osama did. You sir are more then welcome to spend your fortune fighting evil doer's in the world. As for me, I am not cool with over 900,000 casualties, $1.3 trillion spent, 2 soverign countries demolished and over 5,000 of my fellow service members dead just so we can act like the world's police. It is like superman habitually taking a shool bus full of kids and thowing it at incoming missiles and blowing them up in the air so they didn't destroy the houses they was aimed at. Am I a persona non grata anymore, dear CNN? Why my postings don't appear? Have we become like them? No, we still believe in the rule of law. We still believe religion and government should be separate(well, most of us do). Osama would have gotten a fair trial (or as fair as someone like that could expect) had he been taken alive. The sight of college students who probably had no connection to the attacks throwing a tailgate party right in front of the site where human remains are still occasionally found also made me cringe, but please, people around the world pretty much have their minds made up about America one way or another. We could have lowered the flag to half-mast for our worthy opponent and been as quiet as nuns and people who hate us would still hate us. Likewise, we could have pickled his body and put it on display and people who like us would say it was a smart idea. We still believe in rule of law? Where have you been for the last 70 years? I've held off on posting a comment since reading this, but after reading the My Take written by Linda Kolodkin, I'm chiming in. I worked in New York from 99 through 02, halfway up the island from the towers in midtown Manhattan. I remember what happened. I remember the fleeing people, covered in soot and scared in a way the word terror hardly does justice. I remember the false rumors of survivors being found alive, falsities that gave people fleeting happiness before the truth dashed it away again. I remember wanting to do something, anything, to help, to make magic and turn back time. I remember rolling up my sleeve and giving blood. Most of all I remember how powerless Bin Laden's evil left me feeling. Powerless and afraid for my friends, my family, myself. Sure, some of the younger generation are celebrating death, but most of us in our thirties and up are celebrating life – the return of our nation to a life without the fear of Bin Laden, after a decade of fearing what he had in store next. Celebrating that life could continue with closure for those whose loved ones perished in the Towers, the Pentagon, and fields of Pennsylvania. No, not just their loved once, even the distant acquaintances are celebrating life with closure. There are so many pent up emotions – feelings of tension and fear we had gotten so used to we didn't even recognize as present anymore – released by justice being served. Did I celebrate? I hugged my wife. I hugged by fourteen year old son who doesn't remember a time before the wars. I hugged my three youngest children, all born into an era of war, who have never lived a day in peacetime. So yes, yes I celebrated that Bin Laden was dead. I celebrate his death every day, and will until the day of my own. please stop posting "articles" by your students (like the article by Lauren Kolodkin) on this blog. You are making a mockery out of CNN. I remember CNN used to stand for world-breaking news and serious journalism. Now it's been degraded to a third-class college newspaper posting one stupid article after the other, and you are adding to this pile of garbage. If we collectively agree to lower our standards, in 20-30 years time the world will be populated by brainless robots. I think he answers his own question. "drunken, mindless, vulgar." Of all the things I witnessed, none of them lived up to this high-minded, self-righteous, & patronizing appraisal. It was a celebration of the fact that freedom was victorious over a truly vulgar ideology (at least for a day). And it was relief that no more would be killed by a mass murderer. That his reign of terror had ended. But it's so comforting that this guy can so easily remove from his mind the atrocities committed by OBL. Again, he said it best. The only thing on his mind was not the death of 3000 plus. But himself. His own mortality. Maybe if he could be comfortable enough with himself, he might be mindful of teh death of those on 911 & the celebration of justice being done to evil. Those 3000 will never be back again. But I'm sure he will live another day to use tragedies to remind him of himself. That's true moral superiority. While we're at it, shame on those in the 40s who celebrated Hitler's demise & the end of WW2 as well. I appreciate you putting into words the feelings I couldn't effectively verbalize. While I did feel a surprising sense of relief when I read the news of Bin Laden's death, the celebrations did not make me proud or happy. Thank you for so eloquently expressing an alternative view. when exactly did you see this? did the sncees of war scare you? don't watch next time. call your mommy, cover your head with a blanket, and have her talk to you calmly in her best mommy voice until it's over. and don't worry about our troops they're real men and women. you'll understand some day. The Afghan war was the last major, genuine proxy war of the present millennium. In the initial stages, it was the US, which used Afghans, Pakistanis and Muslims from other countries for making the Soviet army bleed without losing American lives. As the casualties amongst the non-Muslim Slav soldiers steadily mounted causing misgivings about the wisdom of the war in the Russian region of the USSR, Moscow increasingly started replacing the Slav soldiers with Muslims sent from the Central Asian Republics and the Caucasian region. Thus, in the closing years of the war, the US and the USSR tried to undermine each other and promote their national interests and strategic objectives by making the Muslims the cannon-fodder. I ATE PORK to celebrate UBL's death. UBL caused so much grieve not just for Americans but the whole world. Ate pork just to celebrate ? Poor guy you must be do not enjoy eating meat until there is a celebration ? freedom of speech and human rights ?! So it is that you either you write what they would like to hear,read otherwise if you are not a hypocrite as should then better watch it out to what you say if you had any believe of such human rights and freedoms! With out you know it, helicopters or thugs landing on your roof top or at your house back yard shooting you dead then throw you in a bag off a helicopter into the Sea with out being heard...!? Any wise family men should be stopping any writing on blogs or just keep your feelings and views for your self to be safe....!! When I first saw this post on google search, I thought, „finally, people who are speaking out against the celebration of murder“ and then I read it, realized it was religion affiliated and my heart sank a little. This post will not be religion bashing, so no worries. I completely understand where this religion Professor is coming from. When I first heard the news of bin Laden’s death, I don’t really remember what I thought. But then hours later when I heard that he had be intentionally shot and killed and then I heard what Obama had said about it, I started to feel really uneasy. I too was unsure why, but I knew it had to do with the words ‘justice has been done.’ Not ‘justice has been served’ as we are more accustomed to hearing, no, but ‘justice has been done.’ I’m still not sure why this choice of wording makes me uneasy, but I welcome thoughts as to why it makes me so. I then later heard that people were throwing parties and celebrating, and then when I actually saw it on television, I almost threw up. I too immediately remembered the pictures of the Muslim countries celebrating after 9/11 and with children holding and shooting off guns in joy. I thought to myself, “we’ve become the very thing we’ve fought so hard against, we are no better than them.” Directly after this, I felt a twinge in my gut, got really sad and realized in that very moment, I’d just lost all faith in humanity, which is why I’ve been trying so hard this whole week to find evidence online and elsewhere that can help bring some of that faith back. I can’t seem to say what I think in public, as the last time I tried someone reacted as though I was pure evil to even insinuate that celebrating over a killing was a bad idea. Here is what happened: I am currently in Germany right now, and I am not sure how much German news gets talked about back home, but there was a very big debate over whether the German Chancellor should have said that she was happy to hear of the killing of Osama. I am in a German language class and being the odd one out, I had suggested that it was wrong for her to say such a thing in public. I then proceeded to suggest that what Obama had said was also wrong to say in public, but no one in my class agreed with me. One person even pitched a counter argument that suggested I would feel differently if my family had been affected by terrorism. I answered quite simply that naturally I would feel a tinge of relief, maybe even joy (as I am indeed human and that is a normal, human reaction), but I would not openly celebrate and publicly announce that I was happy that someone was dead. There is a huge difference between how you act and feel in public and how you act and feel in the privacy of your own home (or your own person). People like Obama and Merkel are public figures and have a greater influence over the masses. The celebrations that are taking place are a direct consequence of how they preceded with the news of the death, and how they announced it. The reason why I was a little saddened to see that this writers post was affiliated with religion, is because I am in no way, shape or form religious. I guess people call that an Atheist or something, I’m not really sure. I can only seem to find people with a religious affiliation who have the same sick reaction as I do to what has taken place. This saddens me because that means either I am alone in believing that there is really something to being truly human, religion aside, or non-believers such as myself are too afraid to speak out. Take me for instance: I’m hiding behind an anonymous post with a fake name. On one side it must be nice for the religious people out there to have their God backing them and giving them strength to fight for what they believe in. People like me, if there are other people like me, only have humanity, which has completely failed us. That means we have nobody backing us. And please don’t take offence when I say this, as it is not my intention to offend anyone, but it is a real let down to only see religious affiliations take a stance against this disgusting display of I don’t know what, because many people take one look at what is being said by these religious affiliations and they stop listening, simply because it is religious. Sad but true. And because of this, many people are not going to listen or try to understand that this event and the aftermath of this event need to be quite honestly scrutinized. State vs Religion…hmmm…I guess it really will always be this way. . When did we all just stop being simply human? When you put your faith in humanity you are bound to be disappointed. Do a history lesson about what humans are capable of and then tell me you are truly surprised at your current emotional state. This is why religion has endured for as long as people walked the earth. "There is a huge difference between how you act and feel in public and how you act and feel in the privacy of your own home (or your own person)." That is what we here call hypocrisy. If you feel happy in your heart and hide it...you still feel happy. Doesn't make you more righteous that the person who felt happy and didn't hide it. We haven't "stop being simply human". That is the entire point. We have not changed in thousands of years...we are the same. Our hearts are the same our DNA is the same. We are human, we are weak, we are sinful that is reality. You can pretend that we are all good but just look into your own heart and ask yourself when was the last time you felt jelouse or weren't completely honest. We are all in the same boat together. You stated “we’ve become the very thing we’ve fought so hard against, we are no better than them.” No Hope, we have not suddenly become like them we have ALWAYS been like them and you are right we are no better than them. Hope, I share your dismay over the celebration of Bin Laden's death, though for different reasons. In my opinion, it is a shame that it had to come to this. It is a shame that we murdered him. It is a shame that people don't look beyond the surface of the mainstream media, government propaganda regarding 9/11 and the American/Middle Eastern conflict. It is a shame that anyone would exalt in the death of another. I did lose family in 9/11, it made me sad, it made me angry, it made me pensive and then finally, for whatever reason I think it gave me more compassion for the loss of others, including the loss that would drive others to the point of "terror." The way to solve the problems that divide us is to be bigger than them. Dancing in the streets over a dead body is small. I am tired of people assuming that the celebrations came from a place of hate. I actually find the backlash sanctimonious. I will not judge other people's motivation for celebrating. Relief can take many expressive forms and even though I may not have reacted the same way they did I do not presume to know their heart and accuse them of being "hateful". I will not post a Martin Luther King Jr. quote t and make them feel like they did something wrong. I know in the end it's all about what's in your heart. Those who are full of hate will reap the consequences of that hate but last time I checked I did not have the power to look into somebody's heart. Anyways, the celebrations did not make me cringe like the self righteous finger wagging people who criticized it does. And I don't think the celebrations would have been different if he had lived and they had just caught him as opposed to killing him. People weren't just happy because he was dead I think they were happy because of what his death represented...hope for an end to terrorism.